When the jet touched down, you thought of all those years you spent living here, not quite your home town but enough to call yourself a local, what foods do you rush to get? When I was living in Beijing, I came back for burger, pizza, and steak. But I am in the states now and Seattle is full of difficult choices. First meal we went for Serious Pie. Locals know that they make half-size pizza during happy hour, so that you can get more pizza for your stomach capacity. The SLU (South Lake Union) establishment is less touristy, more spacious, and stocks a full bar. Yes, a beer for each of us and two pizzas: seasonal mushrooms and egg plus arugula. Next morning came breakfast sandwiches from Dahlia Bakery. Their coconut cream pie is really to die for, but the breakfast sammies, served before 2pm, are the real local secret. I also recommend the beignets, imagine what clouds taste like. To our own surprise, our feet took us to Starbucks’s Princi establishment in Capitol Hill. This tourist’s destination also houses a touristy Italian bakery that is clean, casual, tasty, and enjoyable. It is not a starred restaurant, but you can sit, eat, and chat for a long time and have a good time. Of course we went to Blue Acre’s happy hour (on weekends!) to shoot down oysters at $1.5 each. The excellent bar has enough beers to choose from, but I always get my Mac-n-Jack here. When in Seattle, always ask for this beer, another local secret. Pike Place called us and we picked a time to avoid the summer tourists for La Panier and Piroshky. It’s the best macarons. Their feuilletes gave us the smiles: yes, that’s what we remembered. Piroshky, what can we say, it is simply a must-eat when we come back. Sunday morning, at 9am sharp, I was standing outside of Crumble and Flakes. They make pistachio croissants only on weekends. This croissant has crunchy pistachio topping and cream in the middle. I have searched elsewhere for the same, none came even close to theirs. While we were there, we of course loaded up a full box of other baked goods. We ended the trip at Barolo. This place is the best happy hour downtown, but we came for dinner. Foie gras and calamari for appetitzers plus risotto for the entree. One of the best Manhattans from the bar. Needless to say, we gained weight. Sigh.. That’s for the infamous later. The drive was the main deterrent. We crossed the Golden Gate, then we trekked 90 minutes to arrive late at the lunch spot. This Inverness restaurant was cozy, friendly, delicious, and, yes, expensive. We pigged out on oysters and walked out 2.5 hours later and each about $80 poorer. Pt. Reyes Lighthouse is at the west-most tip of this peninsula. 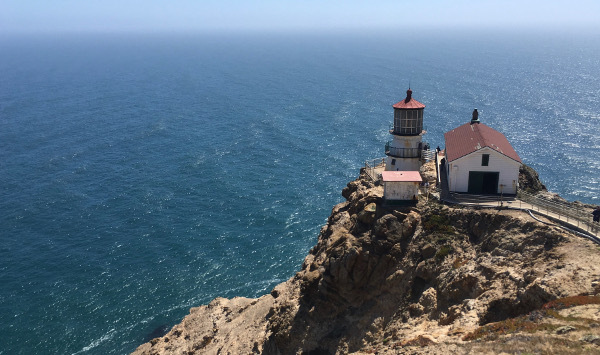 The long descent down to the lighthouse was breathtaking with drop-off cliffs, expansive ocean, and, of course, the lighthouse at the end. The climb back took 308 steps, a good work-out. I imagined the lone lighthouse keeper in the old days climbing back and forth through the wind, rain, and whatever elements. Who would take the job? On the way to the lighthouse are many “historical ranches” and an active dairy farm with cows grazing on the meadow. The cows seemed lazy and happy. Does that mean the milk tastes better, or the meat more delicious? We skipped Muir Woods and made our dinner reservation. Excellent Margarita and Tequila convinced us that the choice was correct. Joanne Weir’s artisan Mexican foods helped. After dinner, we walked down the waterway and my brain played Otis Redding’s “Sitting on the dock of the bay.” The song wouldn’t go away from my head for a long time. Like a pasta dish, every home cook that makes them has his/her own recipe. When asked, they can’t tell you. These are both family traditions and spontaneous creations. ZongZi is the same. There are restaurants famous for it, and homes that make their own every year. In my childhood, it was a neighborhood thing. Families exchanged their home made ZongZi and kids get to vote for their favorite. It was one of my fondest memories. ZongZi is the traditional food celebrated on the Lunar May 5th (June 18th for 2018). 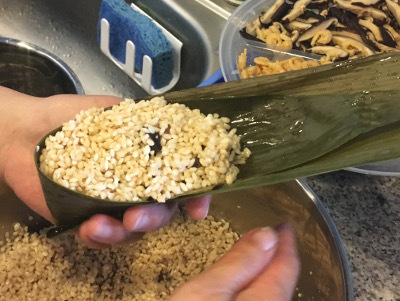 Making ZongZi is a big production no less than the Thanksgiving turkey. I have watched the process since I was a kid. Yet I knew so many who never dreamt of making it themselves. Soy Sauce, dark About 6 table spoons. Adjust to taste. 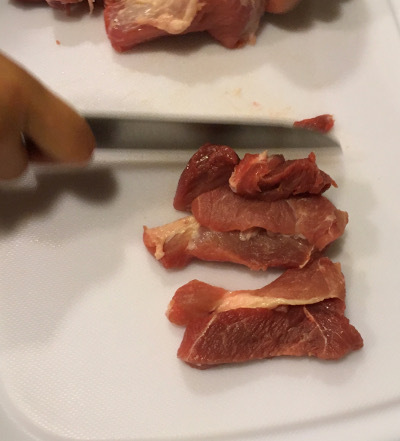 Cut pork into 3-inch long pieces the thickness of the big thumb. Don’t trim the fat. Pour in normal (or light) soy sauce, mix well, cover and refrigerate over night. Soak bamboo leaves in water for about 12 hours. Longer is fine. 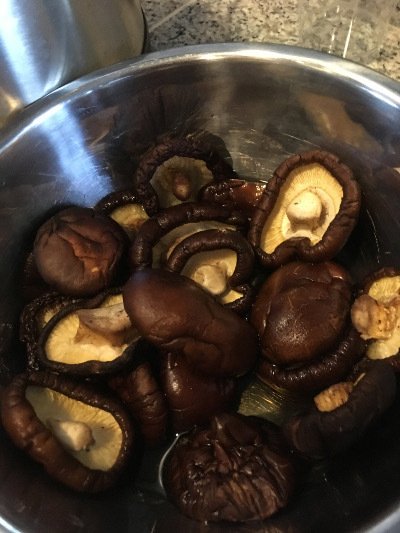 Soak rice, mushrooms, and chestnuts in water for about 4 hours. Trim the bamboo leaf stems. Cut mushroom into strips, about 9 to 10 pieces per mushroom. After 4 hours, drain rice. Add dark soy sauce, mix well. Have at least one, preferably more, large stock pots. 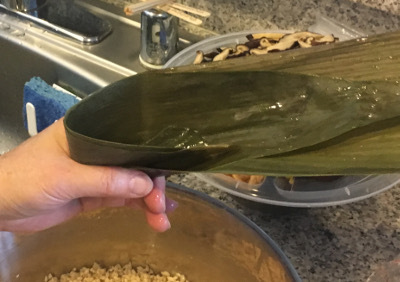 Making ZongZi requires some practice. 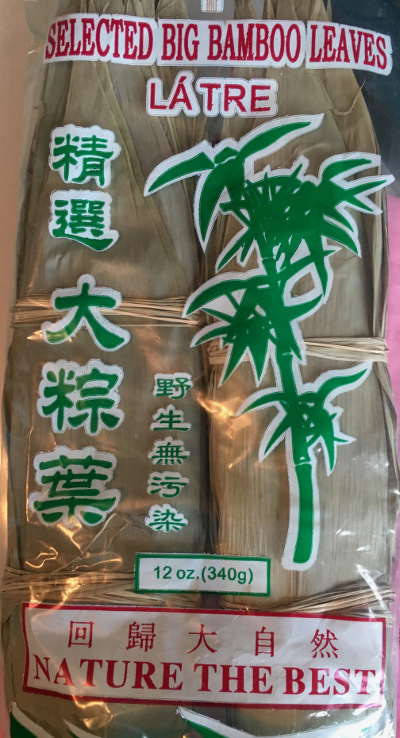 The general idea is to form a pocket with two bamboo leaves, fill the pocket with the ingredients, close the pocket, and secure it with a piece of twine. Afterward, put them in boiling water enough to cover. 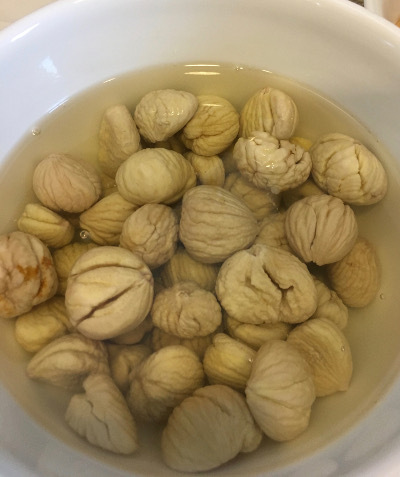 (Bring to boil before adding ZongZi into the water.) After the water comes back to boiling, reduce heat to a “slow roll” (higher than simmer) for about 90 minutes. We reuse the same pot for subsequent batches. The later batches therefore taste better from the more flavored broth. Beginners need to learn to judge how much ingredients to put into the pocket. 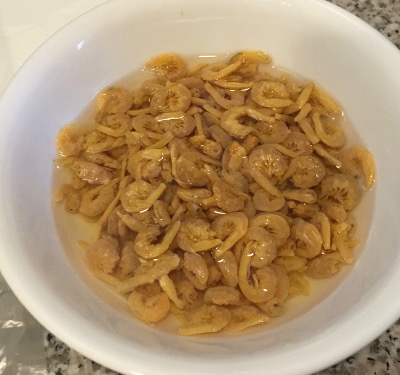 Generally, fill slightly more than what feels “comfortable.” For each one, make a bed of rice, put two pieces of meat, mushroom, and shrimps, then cover with another layer of rice. By weight, the rice and meat are about 3 to 2 in ratio. 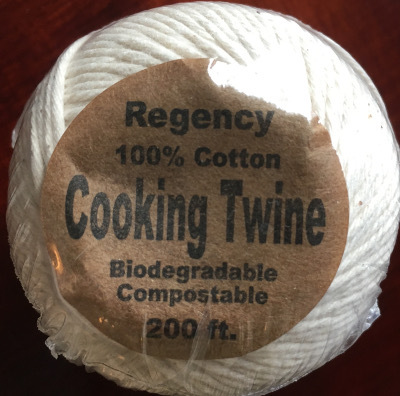 The twine should be snug, not loose for the pocket to disintegrate or too tight to cut into the bamboo. 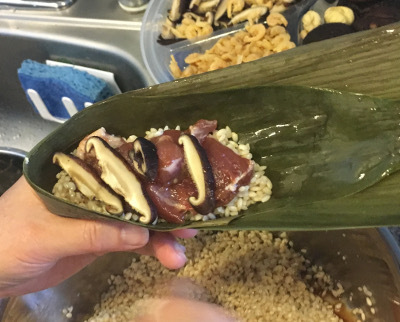 As those ZongZi cook, the rice expands and meat shrinks. The bamboo pocket may burst if the twine was too tight. The sweet variations substitute the meat with something sweet; red bean paste is the most common. 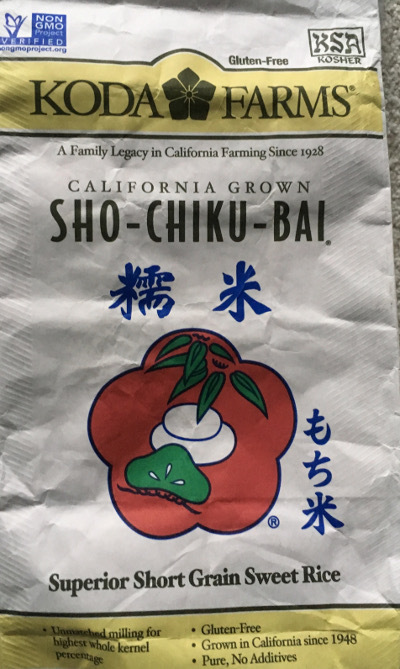 Find canned red bean paste from a Chinese supermarket. Form cylindrical sticks roughly the same size of meat, or about 2 ounces, with a small piece of lard. Rice should be just plain and soaked. 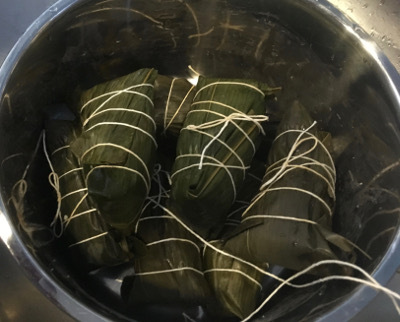 Wrap and cook ZongZi the same way. We had ZongZi parties when I was a kid. Similar to pizza parties, people come together to make their own with common set of ingredients, or even different ones. We invented different ways to identify the “maker.” That’s part of the fun. Remember it takes about 90 minutes to cook them. I couldn’t sleep, thinking of how to construct a grape arbor in an imaginary backyard. Months later, over a weekend, two of us did a version of just that. 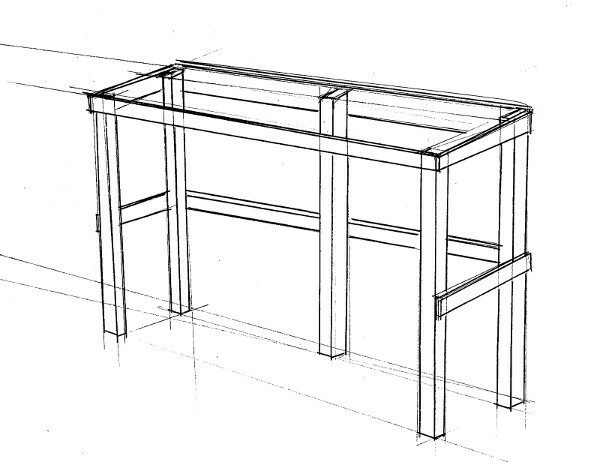 With the remainding wood stock, we then made two benches. The whole thing is about 8-foot tall, 4-foot deep, and 12-foot wide. The back posts are cemented in the ground; the front ones are free-standing on concrete floor. We planted two grapes close to the back posts so that we can train them up the arbor. When I was a true country boy, I would do monkey-bar on a neighbor’s grape arbor and picked from the vine as I played. The arbor was made of bamboo, abundant and nearly free. We lived in a sub-tropical area. 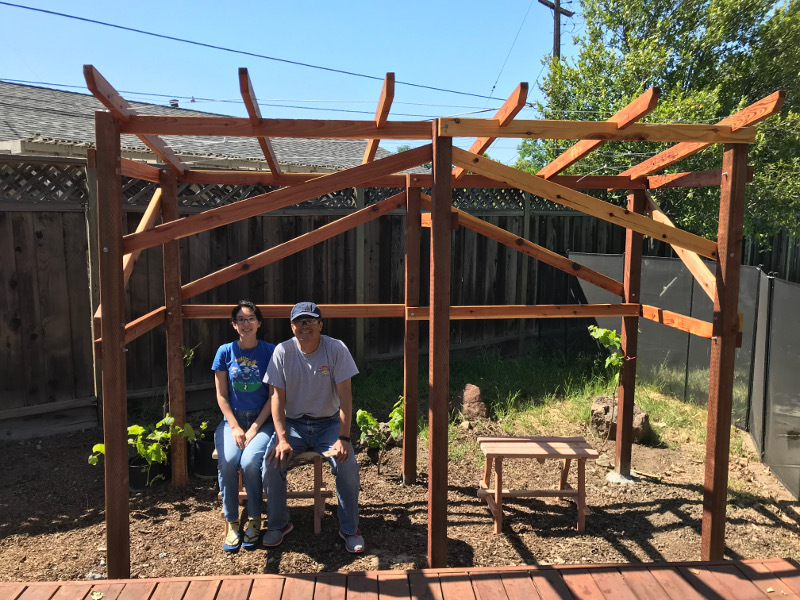 That arbor provided shade, play structure, and sweet desserts. It was among my best childhood memories. First time I visited Napa, I was surprised how grapes were trimmed low and not over-hanging. I then understood how things work. Grapes produce fruit only from the sprouts. The wine makers optimize for production and ease of harvesting. Backyard gardeners usually have a different motivation. The key, however, is the same: train the grapes by tying its canes and prune them over the winter. After the grapes have reached the final shape, cut off nearly all new canes of the year, every year. They won’t fruit. As I sat under this bare arbor, I imagine the canes sprawling all over the top. Every spring, we will see the new sprouts budding out. By summer, we will anticipate the cluster turning into edible fruits. We will sample to check their ripeness and eat them as we harvest. Then we will see the leaves turn brown and mentally prepared for the year’s pruning work. And we won’t see the arbor anymore. It’s just grapes. Say you are a highly coveted skilled worker in a hyper-competitive industry. This is a good day. You received two job offers for similar jobs. Both seem challenging and fun. Two companies are both publicly trading. They are comparable by large: in benefits, perks, and management. The total cash equivalent of the offers is also comparable. For argument’s sake, let’s call it $20,000 per month. But there is a critical difference in its structure. Company A just give you $20,000 in cash. Simple and easy. Company B give you $10,000 in cash. Their stock is trading at $10 per share today. They promised to give you 12,000 shares of stock by the end of each year of your employment. For the past several years, their stock has risen in price very nicely. It is quite simple; company B is actually offering you more since their stock probably will appreciate. By the end of the 1st year, you would have received $120,000 in cash and 12,000 shares. Those shares may have gone up to more than $10 per share. You would have ended up better. We all knew that stock prices may fall as well, but the likelihood is small as the company is doing well and competitive. The answer seems to be B. Yes? Company B forces you to invest half of your income in a single company. It does not really matter how well the stock performs. The #1 principle in investing is diversification: never put all your eggs in a basket. Take A’s offer, buy 12,000 shares of B, and you will end up exactly the same place had you taken B’s offer. The investment, now, is your own choice. Google the title. My browser returned 650 million hits. Decades ago, an executive tossed this question to one of my colleagues. She was stunned and stumped. So was I. Since then, I have never asked this question to anyone, since I am still searching for the answer. Recently, a senior manager said in the boss’s staff meeting, “Months ago, I said that your approach won’t work for the other project which is now in disarray. I was proven right, and you wrong. Heed my advice or you will fail again.” Everyone sat in stunned silence. She did not even know how she was wrong. 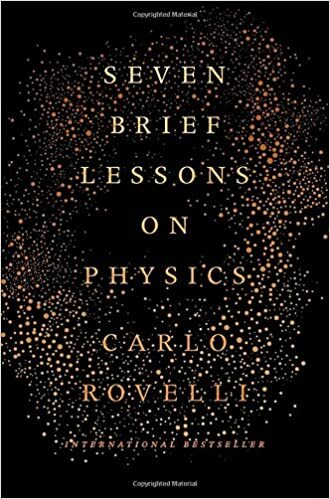 At the logical level, the causal relationship with the other project was not clear. Before that, the past experience does not predict future. Like everything else, the project was risky to begin with and it could have failed for completely unrelated reasons. Her prediction does not make her more right today. No one knew her batting average either, was she right 1% of the time or 99%? Being right once before does not mean she will be right again. At the human level, nobody likes to be called wrong. Nobody likes “score keepers.” Nobody likes someone who predicts failure only to prove a point. Not so surprisingly, she was voted off the island the next round. Only at the simplest level are opinions or judgements either right or wrong. Most of the time, there are different points of view and there is no absolute correctness. There are risk v. benefit, short- vs. long-term, market share v. profitability, strategic v. tactical, etc. There is rarely an obvious right answer to any question. Secondly, execution effectiveness predicts success better than the quality of the decision. For example, an efficient factory can produce goods at lower costs and faster. It enables a lower price point and wider distribution which could win over the competitor even if the competitor’s product is better. In today’s workspace, execution frequently means effective collaboration where argumentative behavior is damaging. I know so many gun owners (myself not being one). When a long-time acquaintance dined with me in Austin, TX, he was carrying: a 9mm in a pancake holster, concealed. A colleague, in Seattle, told me he had over 20 firearms in his house: rifles, shotguns, pistols, and, yes, semi-automatic. He went target or clay shooting over the weekend as the primary family entertainment. He kept several unregistered, “so that the government won’t know about them.” Another friend, in New Jersey, complained long and vehemently how ridiculously the ammo prices had gone up, particularly .22 that he used for weekend “fun shooting.” He believed it was a government conspiracy. A close friend, in San Jose, recently acquired an AR-15 via mail-order, together with a scope and many expensive accessories. He practiced taking it apart while watching TV at night and goes to the range on weekends. All of them are peaceful and rational people. They like guns. A recent robbery victim told me that the only things taken were two pistols: a Smith-Wesson and a Ruger. Police said that guns are easy to fence and therefore a popular target. Unlike the rest of the world, the US is full of guns. Whatever gun control laws, they change only new gun sales. No laws can reduce existing guns in people homes today. Guns and ammo are very durable. Just minimal care will keep them operational for decades. This is simply and depressingly factual. It is a statistical certainty that some owners, however peaceful and rational, will lose control sometime in their lives. They may have a mental break-down, under influence, get caught in a heated moment, have left it unattended, or simply be careless. Each and every one of those leads to a tragedy. And I don’t really know if there is a quick solution to this. An epiphany came when we were cleaning our dishwasher, after almost 10 years of blissful neglect. GE engineers failed me. To clean the dish washer, I needed to remove the top rack first. That required two plastic stoppers with the instructions from a YouTube search. After the top rack, I needed to remove a feeder pipe, the bottom sprayer, and the main water conduit. Then, I needed to pry out the waste basket which is also the locking mechanism for the mesh. I wouldn’t be able to do this without consulting the internet multiple times. And the taking apart was the easier part. Underneath the mesh and sprayer was gross stuff matching the TV show “The Dirtiest Job.” There were brown greasy clumps, brown-black caked layer on surfaces, and hard mineral fused on whatever. An hour or so of hard scrubbing later, the reassembly process started. That took only 10 minutes or so. We trial-ran the dish washer with a cup of vinegar on the top shelf, facing upward. Then re-ran it with glassware and mugs. They were spotless. Yay! Life is full of filters. Wherever a filter exists, there must be a way to clean or replace it. You can simply spray clean your screen window. You will discard your coffee filter. You drive to a mechanic to replace one or several filters in your car. I sincerely hope you have a better dishwasher than my 10-year old GE Profile. I urge you to check it today, and wish you the best.